In this moving, tender and very personal play from Pulitzer Prize finalist and Tony Award nominee Sarah Ruhl, the longing for the immortality of Neverland confronts the inevitable passage of time. Five siblings - 2 doctors, 3 Republicans and 1 teacher of rhetoric - move from their father's hospital bed to a Jameson-fueled kitchen table wake, and then head for the "second star to the right and straight on until morning" (J.M. Barrie). In this world of make-believe, now seen through the eyes of these adults, there is still magic and wisdom for the young at heart. "...Undeniably, the death of a parent at any age (and Ruhl lost her father as a young woman) creates the ultimate "lock-out time" between childhood and adulthood. There's also a touch of "Our Town" in the epilogue, where Ann and her father go back in time to her triumphant performance as Peter. But "For Peter Pan on Her 70th Birthday" works best if viewed as a daughter's gift to her mother. Kathleen Ruhl and the cast deliver delightful and sometimes-poignant performances, but the story never fully soars." 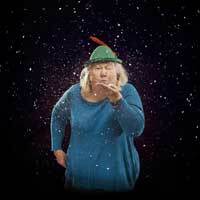 "..."For Peter Pan on Her 70th birthday" - produced at the Theatre of Louisville Humana Festival and Berkeley Repertory Theatre last year, and now receiving its Chicago debut by Shattered Globe Theatre - marks something of a departure. It is a rueful, heartfelt, mostly naturalistic little drama about how we live, how we die and how we mourn those we love. And it is told through one particular episode in the life of a close-knit but argumentative Midwestern family whose allegiance to Catholicism is as varied as its allegiance to certain political and social beliefs." "...Omniproduced playwright Sarah Ruhl wrote this one-act as a birthday gift for her mother, Chicago actress Kathleen Ruhl, who plays the title role in this Shattered Globe production. I guess the rest of us are supposed to care, because the playwright hardly bothers to make the content matter. Instead she sketches three scenes-five siblings at their father's deathbed, then at his wake (where his ghost putters about to little end), then in an insufferably twee version of Neverland-full of calculatedly bittersweet reminiscences, softball political observations, unchallenging religious musings, and ample unearned sentiment." "...Smoothly directed by Jessica Thebus, this 75-minute stage souvenir delivers a few cunning snapshots among the rapid-fire remembrances. But they're never enough to make this sometimes cloying stroll down Memory Lane engaging, let alone useful. 7oth Birthday simply lacks the open-hearted embrace of Our Town, let alone the driven hauntings in Long Day's Journey Into Night." "...This is where Ruhl's play becomes a tad thin. Does the magic of the Peter Pan myth still invade the beings even as they age? The final scenes, wherein the five playout Peter Pan and the lost boy's imagination is a tad underdeveloped. The final scene muddles what resolution Ruhl is presenting. While the acting by this ensemble is first-rate, Kathleen Ruhl and the sharp work by Doug McDade was quite impressive. Taken as a whole, For Peter Pan on her 70th birthday is a near miss as it needs a clearer ending." "...If you were a successful playwright, would you write a play as a birthday present for your mother? Sara Ruhl actually did that, gifting her mother, Kathleen Ruhl, with �For Peter Pan on Her 70th Birthday�. Now, Kathleen Ruhl and Shattered Globe Theatre are sharing that unique gift with Chicago audiences at Theater Wit. �For Peter Pan on Her 70th Birthday is a poignant tale of family love and loss." "...I'm not sure what Ruhl could do to improve this play or if she's even interested. No amount of spin is going to make "For Peter Pan" what it claims to be: moving, tender or personal. In fact, it is the exact opposite of those things. In its generic state, it is guaranteed to thrash unsubtly at the heartstrings of anyone over the age of forty who might describe themself as "young at heart," more a calculating insight into the demographics and delusions of the theater community at large than anything even remotely resembling sincerity." "...This memory play, which seems a very personal catharsis for the playwright, will especially speak to more mature theatergoers. Baby boomers, in particular, will identify with the thoughts and emotions expressed by the six characters in this play, particularly as portrayed by Shattered Globe�s fine ensemble cast of actors. With sensitivity and lyrical beauty, Sarah Ruhl�s language and strong, realistic characters create an emotional portrait of an inevitable event we must all eventually face. But if audiences believe it�s possible to become immortal, all they have to do is clap their hands." "...The title, FOR PETER PAN ON HER 70th BIRTHDAY, might also be misleading. It�s not really for children. There isn�t anything shocking that young ears shouldn�t hear. It�s just lacking real excitement. The reality side is ordinary people dealing with passage of time. And the fantasy side doesn�t have enough pixie dust to get it to fly right at the star and straight on til morning." "...For Peter Pan on Her 70th Birthday ultimately fails to enchant because there's not much original in the family scenes and the Neverland scene is clunky. The underlying theme of not wanting to grow up (like Peter Pan) can be read as not wanting to die. Your parents' deaths also mean you now have to be the grownup. But Sarah Ruhl's talent with dialogue and Thebus's direction can't manage to invigorate this play." "...Kathleen Ruhl, a well-known Chicago actor, is performing as Ann/Peter Pan in this production. On opening night, there were several seats marked with �Ruhl� underneath the words �Reserved Seats.� Ruhl took the stage to begin the play�s opening monologue in front of a radiant red stage curtain, framed by an ornate, golden proscenium arch, her family and daughter a few rows away. The beauty of this full-circle moment was palpable."